“The Amazon” is a 13-foot-tall concrete sculpture of a female warrior, with bared breasts, her torso and head pierced by thousands of joss sticks, jutting out like arrow shafts. It’s a tribute to women like the artist who have battled breast cancer. NEW YORK — For the past two years or so, artist Prune Nourry has thought of herself as a sculpture. Nourry, who is French and splits her time between Brooklyn and Paris, learned she had breast cancer in 2016. As she went through treatment, including chemotherapy and reconstructive surgery, she thought of her doctors as the sculptors and herself as the material they were fashioning. Nourry, 33, has created her own work in response to that experience, as a tribute to breast-cancer survivors. 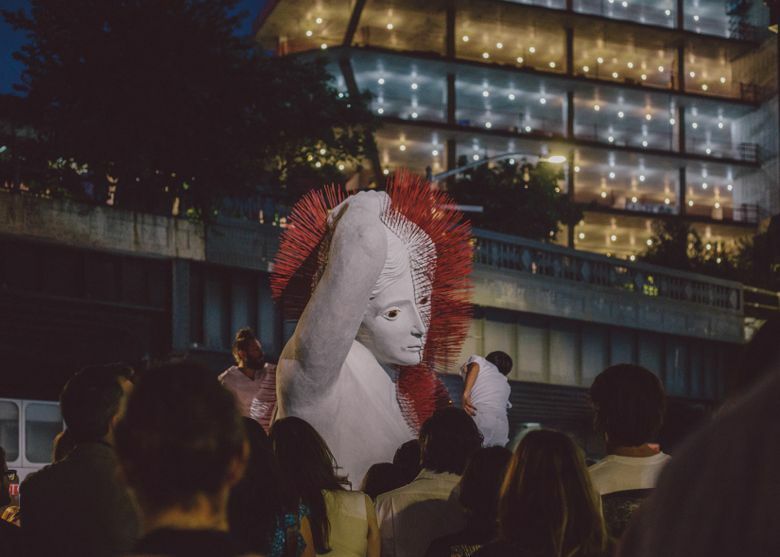 “The Amazon” is a 13-foot-tall concrete sculpture of a female warrior, with bared breasts, her torso and head pierced by thousands of joss sticks, jutting out like arrow shafts. It was modeled after the life-size marble statue of a wounded Amazon at the Metropolitan Museum of Art. Nourry’s version weighs nearly 2 tons and has lifelike hazel eyes, made from handblown glass. It had a public debut last week, in a plaza outside the Standard Hotel in the meatpacking district of Manhattan, where it will be on view into July. (The hotel owns the space and offers it to artists; painter José Parla and pop artist KAWS have exhibited there.) In a private performance, Nourry will eventually chisel away one of “The Amazon”’s breasts. 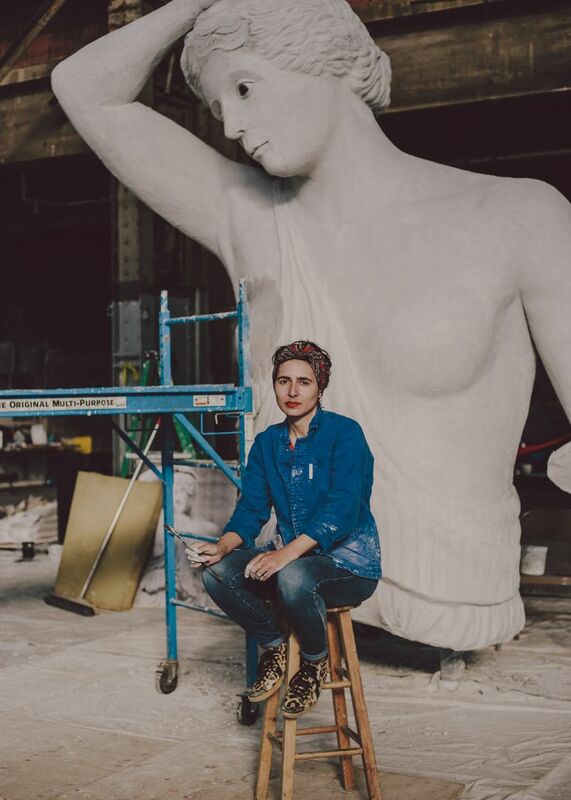 “It’s really, for me, a catharsis sculpture,” she said, in a recent interview at a studio in the Brooklyn Navy Yard, where she and a few helpers created the work. She added that the artwork, and the medical process that led to it, also re-contextualized all her projects that came before, among them “Terracotta Daughters,” a riff on the sculpted Chinese army from the 3rd century B.C. In Nourry’s 2012 version, her 108 clay soldiers are girls, based on real-life orphans, as a commentary on the gender imbalance in China’s culture, where boys are traditionally more prized. It has been exhibited in North America, Europe and China. Nourry had planned to remove one of her Amazon’s breasts in public, but at the last moment decided that was best done in a more intimate setting. Among those present were boldfaced names, friends of Nourry and her husband, artist JR, including Jennifer Lawrence, Grace Hightower De Niro, director David O. Russell and graphic novelist Art Spiegelman. Jon Batiste, the musician and bandleader for “The Late Show With Stephen Colbert,” began the event by improvising on a melodica. As he sat down to play keys, Nourry’s assistants, clad in medical white, joined the artist, who was in a lab coat. Slowly, methodically, they lit the incense; soon the sturdy warrior, with her sheath of protective quills, had a halo of wispy, fragrant smoke. Ash began to cover the ground as Batiste played his closing song, requested by Nourry, called “Don’t Stop.” “It’s a very uplifting song, but it’s also a song about death and mortality,” he said. “She really knows how to tap into the human experience in the most immediate way,” Batiste added of Nourry, a longtime friend and, more recently, a collaborator on projects that unite his music and her visuals. “It’s like a musician who knows how to play one note to make you cry,” he said.